You guys, will it ever stop raining?? I know, I know. It isn’t snow. It is still pretty warm here. But it is starting to feel like it rains every day. And it is a sneaky rain. You never know when it is coming. I can look out the window in one direction and there is blue sky with happy clouds. The other direction looks like a gray sheet of doom. I have been at the playground and had a single individual cloud rain on me and then pass. I’m always surprised by the quantities of thunder and lightening as well. These aren’t just sheets of gray. They crackle with electricity. It seems to rain more often than not on date night. One evening looked suspiciously dry. We hopped into a cab to go stroll by the Forum before dinner. On the way, the skies opened up. We should have told the cab driver to change location, but we were too busy being amused by him. He hated everything. The traffic in Rome. 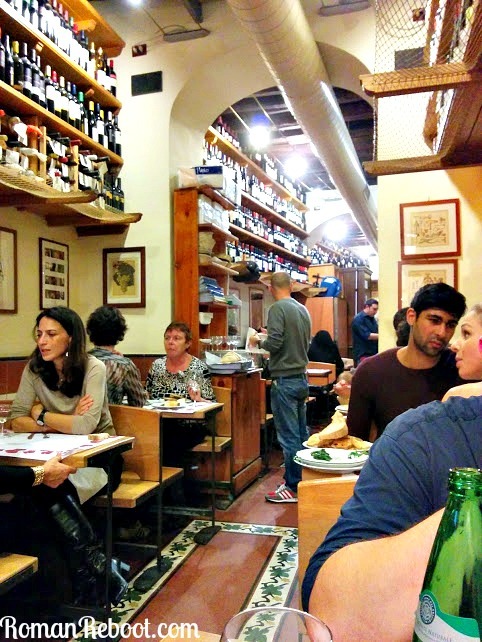 The food in Rome. The people in Rome. And I was hopelessly hoping that the rain might stop before we got there. We stood on the corner sharing an umbrella (mine) and set off on a very truncated walk. It was not a romantic stroll in the rain. It was cold and wet. I immediately headed to a cab stand to get to the restaurant. I can’t find it now, but someone had a travel tip that stuck with me: if it costs less than $10 but makes your life much better, you should do it. For example, if you are starving, go ahead and get that overpriced airport sandwich. I’m not traveling, but I think this is an excellent rule to live by generally. 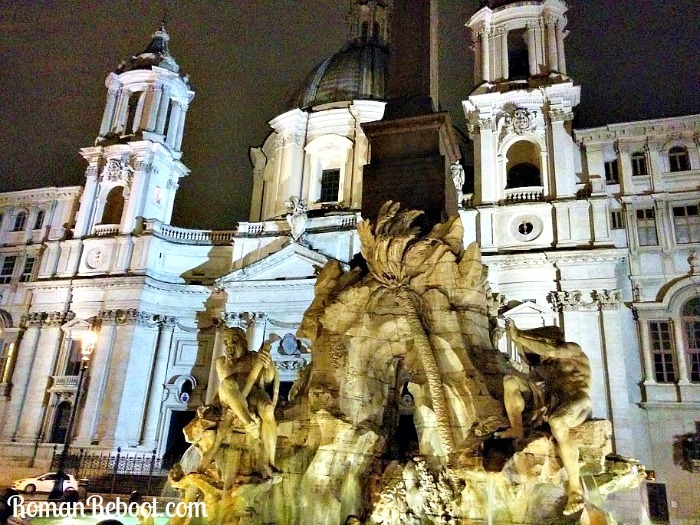 Our destination that evening was Cul de Sac, a wine bar tucked away behind Piazza Navona. A friend recommended as a fun place to try wines by the glass and local meats and cheeses. When we rolled up around 2100 (I know, I’m a baller), the place was hopping. After a few minutes, we were able to get a table in the back. The space is very narrow with the wines up front and center on display. Let’s just say that this is not the place you’d like to be during an earthquake. You could get bottles, but they did have a nice selection of wines by the glass, I think mostly in the 6-10 euro range. We got a mixed meat and cheese plate as well. Although it was quite tasty, I wish we had just ordered individual things. There was a large selection of cured meats and cheeses, with the region of Italy noted. I’d definitely recommend as a place to stop in if you didn’t want to pay Piazza prices around the corner. 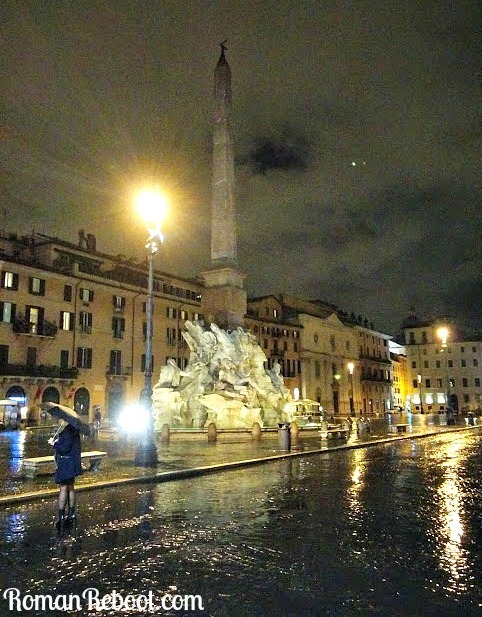 After some enjoyable glasses, we did take a look at the rain-drenched Piazza Navona, one of my faves. I also had the tartufo from Tre Scalini in my sights. This was eaten crowded by the covered outdoor heater where I technically shouldn’t have been because I only paid for a takeaway. Red lips to the rescue!